Denver not only is a first-tier convention city, it is leading the charge in the area of green meetings. The Colorado Convention Center located in the heart of downtown has been designated LEED Gold by the U.S. Green Building Council and has a sustainable programs manager and a 300,000-kilowatt solar array. Denver International Airport, the 5th largest airport in the United States and the 15th largest in the world, is dedicated to eco-friendliness and sustainable energy efficiency with its 4.1-megawatt solar arrays, 100 percent alternative fuel fleet and recycling program. Many of the city’s and state’s hotels, restaurants and attractions also are working hard on the sustainability front, including one of the world’s best-known outdoor amphitheatres, Red Rocks. Check out VISIT DENVER’s event and travel carbon calculators and a report that outlines green practices of several lodging properties. Surrounded by an abundance of natural beauty and dedicated to an outdoorsy lifestyle, Colorado residents and businesses care about recycling, utilize local foods and products, and tap into alternative and public forms of transportation when possible. Denver’s RTD train and bus system is in expansion mode, recently launching a new train line from Denver International Airport and reaching surrounding communities like Golden. Several communities like Aspen, Boulder, Fort Collins and Denver have introduced bike sharing programs for locals, visitors and meeting attendees to explore and travel between venues, attractions, restaurants and more via pedal power. In Boulder, groups can bike to lunch or dinner on a farm, and in Grand Junction there are vineyard tours on bikes. Near Crested Butte, take a scenic raft ride from Almont to a riverside Gunnison restaurant for an Italian dinner or board a horse-drawn sleigh to cocktails and dinner at various mountain locations and ranches throughout Colorado. No carbon footprint needed! 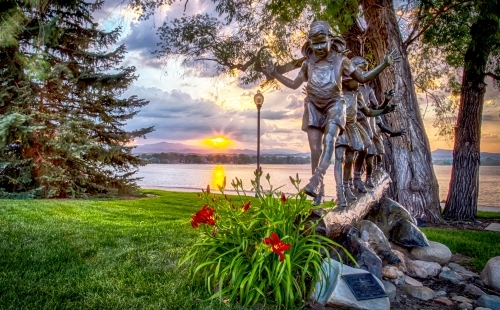 Boulder has long been environmentally friendly and so are many other communities. Ask your destination contacts about what properties and businesses are doing the most to be green, and don’t forget about choosing eco-friendly décor like trees that can be planted later at a local school or plants that can be rented for an evening from a greenhouse or florist. Perhaps include packets of seeds in a conference welcome bag or in-room gift to encourage gardening after returning home and place all conference notes and presentations online or on a reusable flash drive. There are many options to plug into the sustainable meetings mind frame in Colorado. The sky is the limit!